Conrad Murray submitted to LAPD patient files for Michael dating back to Jan 2006. But Michael left USA on June 2005 and didn’t return until Dec 2006. Michael was in Bahrain in January 2006. So Murray must have known Michael before he left USA in 2005. Yet, later in the petition, May 8, 2009 is listed as the first time AEG talked to Murray. If Conrad Murray was Michael’s doctor already 2006-2009, why did Frank Dileo have to call to “inquire about Dr. Murray’s interest in being Michael Jackson’s doctor”? No. April 6 is when Murray placed his first Propofol order. On April 28, Murray placed his second order (Lorazepam & Midazolam). May 12, 2009 was his THIRD order. Brian Oxman is misconstruing facts to fit in his agenda to implicate AEG. Because think about it, if AEG got into the picture in May 2009, then on whose authority did Conrad Murray order Propofol in APRIL and was administering it to Michael? It implicates Michael which doesn't fit into Brian Oxman's fiction. Michael was admitted to UCLA under “Gershwin”, NOT Soule Shaun. Richelle Cooper, UCLA ER Doctor testified about UCLA's pre-arranged registery packs. It is safe to assume that Oxman was the one who leaked the news about "Soule Shaun". The rest of the drugs listed in this petition, including 11 vials of Propofol, are seized on JUNE 29. They were NOT seized “at Michael’s bedside”, they were recovered from a closet, attached to the bedroom that Michael was found in. Murray hid them there. Michael Jackson Autopsy was attached in Brian Oxman's petition and if he was paying attention, he might have had a shot at getting his basic facts correct in this petition. This assumes Murray’s statement as fact. Michael left Staples Center at 1:30am. It takes 22 - 30 minutes to go from Staples to Michael's home. He couldn’t have been home at 1:30 for Murray to give him Valium. The standard dose of Propofol is 2.5mg/kg. Michael weighed 62 pounds so the standard dose for him is 155mg of Propofol. This dose would produce toxicilogy levels of 1.3–6.8 ug/ml so Michael’s levels are within this range =NORMAL. The levels are inconsisted with the dose (25mg) that Murray claims to have given but they are NOT lethal levels. There could be 2 factors that caused Michael's demise. One was because Propofol causes respiratory depression. Michael should have been given oxygen while under propofol, Murray didn't do this. Second, proper Propofol administration mandates the use of an infusion pump to regulate how much propofol flows into the patient. Murray didn't have an infusion pump, he was FREE DRIPPING Propofol into Michael. Randy Phillips is NOT the president of AEG. It is Tim Leiweke. Randy Phillips is the president/CEO of AEG LIVE (a subsidiary of AEG). Paul Gongaware is not the vice president, he is the co-CEO of AEG Live. And it is NOT gUngaware, it is gOngaware. Michael was NOT missing any rehearsal in May. Again, this is a colorful fiction Brian Oxman writes to fit his agenda to implicate AEG. Michael missed 3 rehearsals: June 11, 12 and 16. He was sent home from rehearsals by Kenny Ortega on June 20. The petition claims here that Michael already had a drug problem before AEG allegedly brought Murray into the picture and Murray was hired to HELP Michael get off drugs. Yet later, petition accuses Murray of administering deadly combination of drugs. Email correspondences between AEG and Murray don't indicate anything about Michael’s alleged drug addiction or AEG hiring Murray to “wean Jackson of the drugs”. This is simply colorful fiction by Brian Oxman who, before Michael was even pronounced death and lying in UCLA, has been fixated on: that Michael is a drug addict! It is simply a STUPID allegation not supported by medical facts. It is bad enough that Brian Oxman publically states these STUPID claims, now, thanks to Joe's authorization, Oxman is empowered to make his STUPID claims on official court documents!!!! Moreover, Oxman can’t even see the consequences of his claims! He is claiming AEG, and consequently Murray, were trying to help Michael get off drugs. If Michael was a drug addict, then why the Hell are you suing AEG or Murray, who were, according to your STUPID petition, were trying to help Michael?????? By May 8, 2009 Michael was ALREADY seeing Murray who was commuting from Las Vegas to administer Propofol to Michael since April. So the supposition that AEG asked Murray to fly to LA and “START” treating Michael is simply false. This meeting took place on June 20, 2009, NOT on the18th. The agenda of the meeting was Michael’s lack of attendance to rehearsals and Kenny Ortega sending Michael home the prior day which Conrad Murray wasn’t happy about. This was NOT a “drug intervention” meeting. Again, Brian Oxman portraying Michael as such a drug addict that AEG had to "intervene". Let me accept your premises for argument's sake and assume that Michael was an addict and this was an drug intervention meeting. Then why would AEG turn around and ask Conrad Murray to drug Michael Jackson? So AEG did NOT want Michael “sleepy”. Yet most drugs given by Murray were sedatives and caused sleepiness. This is indicative that AEG did NOT know of the type of drugs Murray was giving to Michael. Michael DID see Arnold Kline after this meeting, on June 22, 2009. So either the petition is making up fiction about AEG asking Michael to stop seeing Arnold Kline or Michael had the willpower to defy AEG and if that's the case, why didn't Michael defy AEG not to see Conrad Murray? AEG was to buy the travel insurance but Murray was to buy, at his own expense, an insurance that includes commercial general liability, business auto liability, workers compensation and medical malpractice. If AEG was Conrad Murray's employers, AEG would have provided the latter insurance. Assistant was to be hired by Murray. There is no mention of AEG firing the assistant. Yes AEG was to provide some medical equipments but AEG was merely advancing money to Michael. Anything AEG were to pay in regards to Conrad Murray were to be deducted from Michael Jackson's earnings from the This Is It Tour. This contract is only useful to observe the type of relationship that was intended between AEG & Conrad Murray but ultimately it is null and void because it wasn't fully executed- AEG & Michael didn't sign. But absence of a legal contract alone doesn't preclude an employee-employer relationship. In determining the dynamic between AEG & Conrad Murray, it is important to examine whether AEG directed and controlled Conrad Murray, not only as to the result desired, but also as to the details, manner and means by which the results were accomplished. AEG didn’t control how Murray performed his service, which days he is to work, how many hours he worked, what hours he worked, the frequency of his breaks, the type of equipment he needed. These were all decided by Conrad Murray and Michael Jackson. 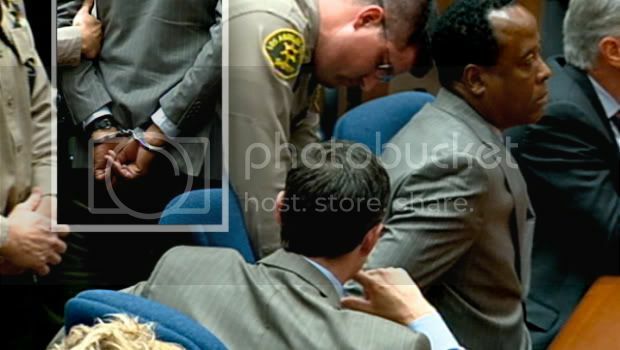 Another factor to be considered is the term and duration of the relationship between AEG and Conrad Murray. The relationship of an independent contractor contemplates the completion of an agreed service within a stipulated period of time. On the other hand, an employment relationship contemplates a continuous rendering of services for an indefinite time. Conrad Murray was retained for a certain period. “Murray attended the rehearsal that day [June 18, 2009]"
Larry King: Do you know Dr. Murray? we had rehearsals, nor was he at Staples Center"
"9 drugs were found in his body (Propofol, Lidocaine, Diazepam, Nordiazepam, Lorazepam, Midazolam, Ephedrine, Flumanezil and Flomax"
Coroner’s office testified that they no way of detecting Flumanezil. No Flomax was found in Michael’s body. So, only 7 drugs were found in Michael’s body. “Beside Michael’s addiction” = Brian Oxman NONSENSE! Michael didn’t have “anemia, chronic pneumonia, chronic bronchitis”. Autopsy report stated that Michael had "interstitial pneumonitis". Pneumonitis is different from pneumonia which is an acute lung condition. "Mild diffuse brain swelling" was caused by lack of oxygen and as noted it was "mild"
Conrad Murray did NOT treat Michael over the weekend. On Sunday, Michael called Cherilyn Lee because one side of his body was hot, one side was cold. On Monday, Michael went to see Arnold Kline. “The contract set May 1 as the commence date. As per the contract only AEG could fire Murray. Michael had no right to fire Murray"
“The presence or absence of Michael Jackson assent, approval or disapproval wasn't required"
"This agreement is approved ONLY if the Artist approves it. Otherwise, none of the parties owe any obligation to one another"
AEG didn’t have any obligations to provide Murray any medical equipment or assistant. CPR machine shocks the heart in an attempt to restart it. Propofol stops breathing and a machine was needed to breathe for Michael. What Murray needed was to intubate Michael and provide oxygen. The oxygen tank at the scene was empty and there was NO supply of oxygen. Even If AEG provided Conrad Murray with a CPR machine, it wouldn’t have saved Michael’s life. AEG representatives aren't medical professionals. There is no evidence proving that AEG was aware of the drugs Conrad Murray was giving to Michael, namely Propofol. AEG doesn’t know what proper equipments Murray needed. Murray asked for “CPR machine, saline, catheters, needles and a gurney”. He didn’t request any monitoring and life saving equipments. He didn’t request AEG to hire an anesthesiologist. It was ultimately Murray's decision to start and continue administering Propofol to Michael without the proper equipment and staff. His Hippocratic Oath mandates that he show the professional judgment to NOT to perform the services that he did (treat insomnia with Propofol and administer Propofol in home setting). EVEN IF AEG PROVIDED CONRAD MURRAY WITH, NOT 1 BUT 2 OF EACH EQUPIMENT MURRAY REQUESTED….WHAT MURRAY DID WAS AGAINST THE MEDICAL LAW, AGAINST THE HYPOCCRATIC OATH. IT IS SUBSTANDARD AND IT IS UNACCEPTABLE!!!! The sole responsibility lies with Conrad Murray, NOT AEG. Conrad Murray is the sole culprit, NOT AEG. but in an amount in excess of the $75,000 minimum for emotional suffering. When Mr. Jackson is able to ascertain damages, he will amend the complaint"
Murray’s legal team was more than happy to oblige that AEG is added to the wrongful death Lawsuit. Because if Brian Oxman alleges an agency relationship between Murray and AEG, it releases Conrad Murray from any wrongdoing. AEG will prove that no such employment or agency relationship existed between AEG and Conrad Murray which will release AEG from any wrongdoing. Not that I least bit care about civil lawsuits by either Joe or Katherine, but if Brian Oxman wants any chance at winning, he needs to put on his thinking cap. This petition is rife with factual mistakes. It impeaches itself. It interprets the law wrong. More importantly, we are NOT least bit bemused that Brian Oxman has perpetuated this “addict” drivel for 2 years now, despite of the scientific evidence to the contrary! Brian Oxman libeling Michael Jackson for his agenda of implicating AEG so he can get paid! Get your facts straight before you write fiction in petitions! FANS PROTEST MICHAEL FOREVER "TRIBUTE"
RANDY JACKSON RECENT TWEETS: What a Joke!